"Glass is a powerful experience, and a compelling narrative, however it falls foul of a directorial calling card"
To say that Glass is somewhat of a unique end to a trilogy is putting it mildly. With Split (2016) thrusting itself unexpectedly into the Unbreakable "universe" with its after credits scene, M. Night Shyamalan arguably wrote himself into a corner as to the conclusion and how he would resolve this. To begin with, it’s not essential to have seen Unbreakable or Split before watching Glass however a repeat viewing of both will provide a much fuller experience and will help you realise some of the more well hidden moments in Split which may not have immediately jumped out as parts of an interwoven story. If Shyamalan is to be believe and James McAvoy's Kevin Crumb aka The Horde was supposed to a character from the outset and was cut, then he benefited from the 16 year gap between entries, and his back story contained some nicely hidden bread crumbs (pun intended) that aren’t immediately obvious on a first viewing. Why am I being cagey with the details above? well a large reveal and main story element hinges on the "origin stories" of both the above mentioned Kevin Crumb and the closest thing we have to a protagonist in David Dunne (Bruce Willis) being intrinsically linked. It helps build a compelling reason for the final third of the climactic showdown. 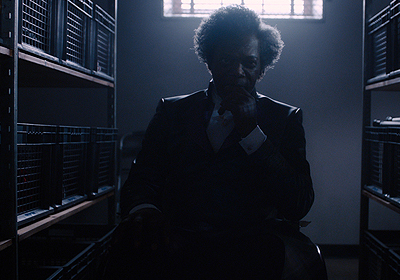 All of the above is without mentioning the character the film is named after, one Elijah Price aka Mr. Glass who is portrayed superbly by Samuel L. Jackson. Being the archetypal "evil genius" of our story you always expect him to be one step ahead, however the reality of the situation is that he was several. My only criticism of Mr. Glass is that he appears to have quite the "plot armour" for the early stages of the film, but he’s still very compelling. Even if you aren't familiar with Glass's back story from Unbreakable then it would be hard to miss the importance and commentary on comic books throughout the trilogy, and there is some brilliant commentary about their place in society. Story telling as part of the modern world and how the source material could potentially influence situations in the real world. In a world where it has been argued that there is superhero fatigue with the genre being in full swing still, Glass feels like a fresh take on the comic book movie. Marvel has now been making the modern generation of comic book movie for 10+ years and the DC Universe is experiencing major success with Aquaman, fresh is good and needed. Here's where it gets complicated though, Glass is a powerful experience, and a compelling narrative, however it falls foul of a directorial calling card of almost all of Shyamalans previous work, there is more than one twist in this story and in this reviewers opinion, not all of the twists land and that impacted my enjoyment of its conclusion considerably. It did leave me with a Black Mirror-esq feeling as the credits rolled, not rightly knowing if that was the true end of the story and leaving some lingering questions as to how the plot made me feel. In conclusion, Glass is a great piece of cinema. It has some important and well thought out things to say about our attitudes to comic books and hero's & villains. However, given how good both Split and Unbreakable were it feels this is a great but not perfect end to what is a 19 year old story. For this reason I'm torn, I’m giving this a 4 out of 5 stars because it is very enjoyable even though it doesn't quite hit the same height as the former two entries.